A wholesome food that supports nutrition, cellular health, detoxification, and anti-aging. It is a complete source of vegan protein (~60%) and a rich source of vitamin B12, often lacking in vegan diets. Additionally, Organic Chlorella is a source of essential amino acids, fatty acids, bioavailable vitamins and minerals, antioxidant pigments, and a unique nucleotide-peptide complex CGF (Chlorella Growth Factor). Studies have shown that chlorella benefits the entire body by supporting healthy hormonal function, promoting cardiovascular health, helping to negate the effects of chemotherapy and radiation and aiding in the detoxification of our bodies. Chlorella’s rich green color comes from a high concentration of chlorophyll. One of chlorella’s most significant health benefits is that it wraps itself around even stubborn toxins residing in our bodies, such as lead, cadmium, mercury and uranium, and keeps them from being reabsorbed. Regular consumption of chlorella can even help keep heavy metals from accumulating in our bodies’ soft tissues and organs in the first place. Research published in 2012 in the Nutrition Journal found that after 8 weeks of chlorella intake, NK cell activity improved. Researchers from the Yonsei University in Seoul Korea studied healthy individuals and their immune system’s response to chlorella supplements. 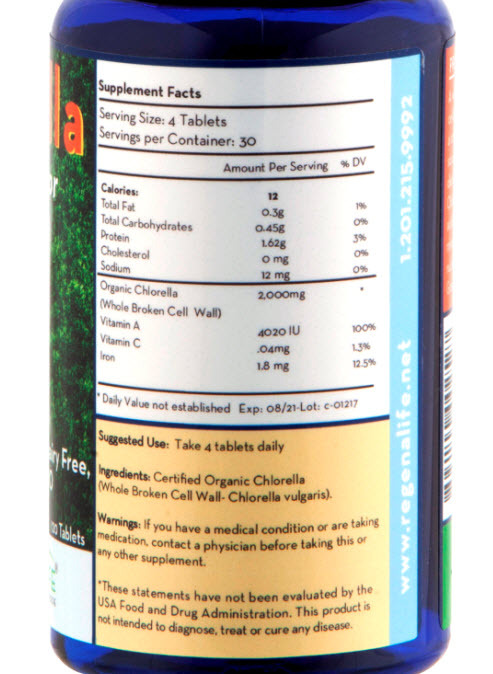 The results showed that chlorella supports a healthy immune system response and helps “natural killer” cell activity. Research continues to reveal that chlorella may also slow the aging process, making you look younger. A study published in the journal Clinical Laboratory revealed that chlorella greatly reduces oxidative stress, that can be caused from pollution, stress and a poor diet. The reason chlorella is so effective at giving you younger looking skin is because it naturally increases levels of vitamin A, vitamin C and glutathione in your body which eliminates free-radicals and protects your cells. By just taking one teaspoon or a couple capsules daily of a chlorella supplement, you can see results in as little as two weeks. Free of wheat, processed sugars, syrup, gluten, corn, salt, hydrogenated oils, soy, rice, barley, dairy, egg, yeast, caffeine, synthetic sweeteners, artificial color, fragrance, preservatives, monosodium glutamate (MSG), and genetically modified organisms (GMO's). Free of heavy metals, sodium benzoate, potassium chloride, or other artificial preservatives. No heat, acid, or chemicals used during processing. Contains no flow agents, fillers or excipients.